Are uPVC windows good for coastal weather? Choosing the right kind of windows for your home is not an easy decision; especially when there are several choices such as wood, aluminium, iron or uPVC. Installing windows in a house can be an expensive decision. But, if the choice is right then it is worth it. The decision to install the right kind of windows in a coastal region is paramount. In case some individual installs anything other than uPVC windows for coastal weather, then it is highly likely that the windows will corrode, become creaky and might even break over a period of time. What makes uPVC windows for coastal weather a good choice? uPVC is based on polyvinyl chloride, one of the most versatile substances found. It is highly flexible and has better performance than its counterparts. It is highly resistant, recyclable and energy efficient, making it a natural choice for coastal weather. India being a tropical country has taken a shine to uPVC and has religiously been using it for producing nearly indestructible windows. 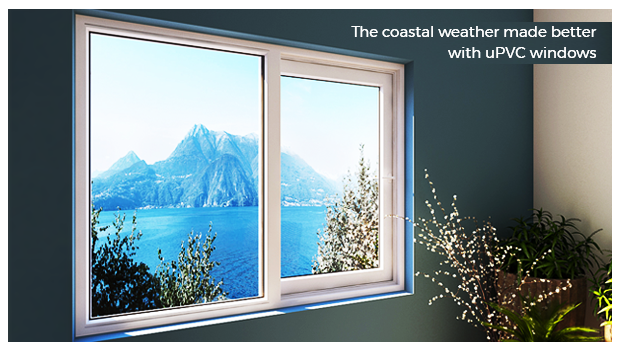 Cities like Chennai and Vizag with coastal weathers have a huge demand for these weather resistant windows. In India, certain cities have coastal weathers such as Chennai, Vizag and Puri. The air there contains high traces of moisture which makes it easy to cause corrosion or rust. But, when uPVC windows for coastal weather are installed in our homes, it makes it difficult to cause corrosion and keeps the uPVC windows new for decades. Due to their weather resistant feature, there is a huge demand for uPVC windows in coastal weather regions. uPVC windows can withstand high altitude winds, torrential rains and storms. Hence uPVC windows in Chennai and Vizag are the norm for every building now. Individuals now rarely rely on any other form of materials for their windows now. Coastal regions are privy to contain traces of saline-based moisture in their weather. With the beaches present in these regions saline water is predominant and hence there is a huge demand for uPVC windows in such coastal weather regions. uPVC windows remain new and glossy as ever and saline proof. Living in a coastal region comes with beaches and unanticipated showers which can make it tough for any individual to keep their house waterproof. This is where uPVC windows for coastal weathers make their way in as the perfect fit; they are leak proof and come with double sealed windows which keep your homes dry and clean. uPVC windows and coastal weather are a match made in heaven. Install uPVC windows in your homes to acquire the fascinating features uPVC windows offer in coastal weather. Explore a wide variety at https://aparnavenster.com/.